Authorities are now using dental records and DNA to make positive identifications of three people killed in a fiery crash in Ingleside. 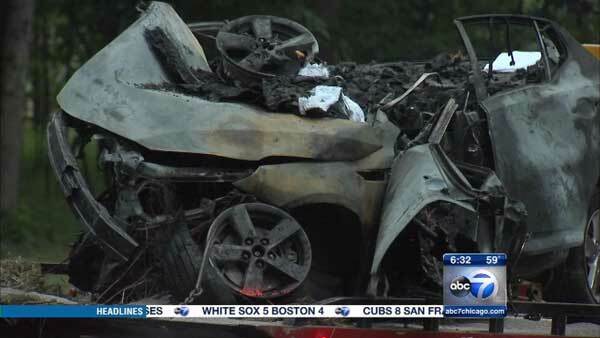 INGLESIDE, Ill. (WLS) -- Three people were killed overnight after a car slammed into a tree and caught fire in far north suburban Ingleside. Fox Lake firefighters responded to West Rollins Road just east of West Lake Shore Drive around 1:40 a.m. Wednesday and found a Kia Optima fully engulfed. They rushed to extinguish the flames, but couldn't get the driver and two passengers out of the vehicle. All three were pronounced dead at the scene. The victims have not been identified. Lake County sheriff's investigators shut down Rollins from Lake Shore to Grove Avenue for about six hours to investigate the crash. They said the Kia was traveling west on Rollins when the driver lost control. The vehicle went off the north side of the road, crashed into a tree and burst into flames. A witness called 911 and tried to help the victims, but the heat was too intense. That section of Rollins Road runs along the southern edge of the Grant Woods Forest Preserve. A source said the stretch can be dangerous because it's dark and if motorists are driving too fast, they can miss the turn. "It's an unlit roadway, surrounded by woods and homes on both sides. There is a curve in the roadway," said Det. Christopher Covelli, Lake County sheriff's office. Longtime area residents say crashes like this happen all too often in this area. The road turns in an S-curve and - particularly at night - many drivers fail to adjust to the quick turns that come up. Some locals call it "dead man's curve." "Last winter there was an accident right around that same tree and it happens every few years for as long as we've lived here, my whole life," said Angela Brady, a neighbor. Resident Rob Tolbert lost a friend to a crash more than 15 years ago. She died after going off the road in virtually the same spot. "She hit the same tree and passed away. This road's really dark at nighttime," Tolbert said. The victims of the crash are believed to include several young local musicians. One victim leaves behind two young children and a fiance. It's unclear where they were going. Authorities said the bodies were burned beyond recognition. They are now using dental records and DNA to positively identify the victims.